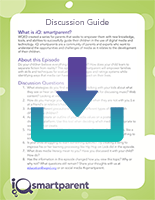 All parents hope to be role models for their kids – but when it comes to media habits, kids are paying attention to how mom and dad use media and the habits they’re picking up from you aren’t always good! Kipp Bradford is a Research Scientist at the MIT Media Lab. His work focuses on reinventing thermal systems. He also explores innovation, manufacturing, and programming languages. His background spans biomechanical and electrical engineering, design, entrepreneurship, and HVAC+R. He is a founder of start-ups in the fields of HVAC+R, transportation, consumer products, and medical devices, and holds numerous patents for his inventions. Brad joined the staff of Carnegie Science Center in 2003 and currently serves as Program Development Coordinator. Most recently he created the educational content for the exhibition BodyWorks. This exhibition allows visitors to explore the human body from blood and guts to bones, brains, and senses. Brad also contributes science articles to the Pittsburgh Post-Gazette and trains Carnegie Science Center educators.